Use the Super Semi-Satchel by Art Bin to store all sorts of bulky items! 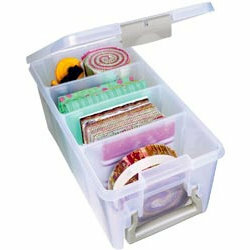 This translucent polypropylene container features removable dividers to create up to three compartments for paints, jars, punches, mediums, or anything else. It is acid-free and has a secure double-wide latch and a sturdy handle. It is stackable for convenient storage. This storage box is approximately 15.25" x 8" x 6.25". This is the perfect size to store all the 6x6 paper pads I've been collecting. Does the trick for storing my dies! I ordered this to use for storage of paper and cards and enevopes. It works great and makes if so convenient to take to crop meetings. 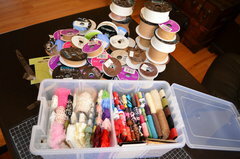 I am thinking I might have to order another one to store all the different glues and tapes that I use. I loved the first 2 I bought that I bought a 3rd one. trying to organize my scrapbooking supplies. this is the perfect size for storing 6x6 cardstock pads, all the make n takes I got from annual shop hops, and die cuts photo frames I make from my friend's die cut machine. now these items are no longer stored in bags, boxes, on the floor or on top of stacks of other stuff. Exactly what I expected. Do people realize the stickles inserts that are always shown in the double sided bin will fit one on top of another in this bin? Much easier to transport to crops than the double sided bin. I use this case to hold pre-cut card faces from cardstock and water-colour paper, as well as pieces that I have coloured with distress inks. I also keep embossed card-face pieces so that I can assemble a card in a hurry. Love it. I have 3 of these. They hold cards I have made and I bought this one to put my Kiwi Lane templates in. I have a zip storage that will fit in here nice and hold my templates even borders. Disappointed that I had to take the dividers out. Could not get the lid closed unless I removed the dividers. Are you able to remove all of the dividers? By: lash48867 (19-Feb-19) Helpful Question? Yes | No Thank you! Report Inappropriate This question has been reported. Thank you! Yes, all of the dividers can be removed from the container. By: hljones (19-Apr-19) Helpful Answer? Yes | No Thank you! Report Inappropriate This Answer has been reported. Thank you!